AirAsia recently launched their own e-marketplace, OURSHOP.COM on July 4, 2018. Most of us that travel frequently have become accustomed to a certain routine at the airport before a flight. Stop for a quick farewell breakfast at that fast-food joint, update social media platforms with the absolutely necessary photos of your passport, and drop by the duty-free stores in the terminal for some quick shopping. A quick walkaround after clearing immigration, and you’ll notice that everything now resembles a shopping mall more than an airport terminal. From fancy perfumes to shining bottles of liquor, the sight of lines building up at cashiers isn’t that uncommon in this day and age. If there’s one thing that Malaysians can’t turn down with much conviction, it’s shopping. But there’s a catch for duty-free shopping—the queues. Armed with the knowledge that duty-free shopping is usually capped at a certain amount, it isn’t uncommon to see 5 customers lining up with 5 individual trinkets to purchase. 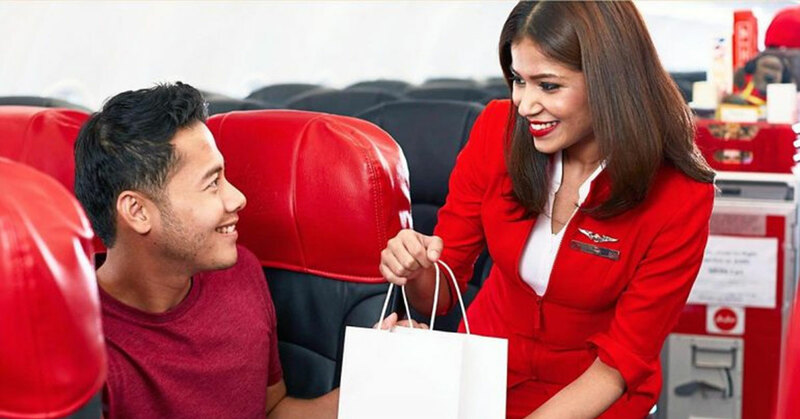 In line with the rise of e-commerce and all that goes along with it, AirAsia is now strongly touting the benefits of buying its AirAsia Duty Free & Merchandise online on their e-commerce platform, OURSHOP.COM as it promises to make life way more convenient for all looking to pick something up at incredible value.. Most people know that duty-free products are generally cheaper than regular retailers. According to AirAsia, the prices listed for goods under AirAsia Duty Free & Merchandise are even lower than what you would get in the airport duty-free shops. Like most e-commerce platforms, you can also expect to have certain deals and promotions that will be available exclusively under AirAsia Duty Free & Merchandise from time to time. When shopping with AirAsia Duty Free & Merchandise online, customers can look forward to having their purchases delivered to their seat onboard the flight instead of having to wait in line like you still have to at typical duty-free stores. So the next time you’re preparing for a flight in the middle of a busy workweek, do your shopping beforehand (so long it’s 24 hours before your flight departure time)—and opt to have your items delivered to you onboard and save yourself some much valued travel time. FYI: You even save yourself a couple kilograms of that precious baggage allowance. When it comes to buying items online in the murky world of e-commerce, who you place your trust in can very often be the difference between getting a pair of Nike sneakers or “Niki” rip-offs. Certain platforms also provide guarantees for specific products or brands. We’ve been given assurances from AirAsia that all products sold via AirAsia Duty Free & Merchandise are 100% genuine, as only trusted brands and authorised resellers are involved. So whether you’re looking to buy a little AirAsia airplane model or a bottle of designer perfume, you’ll at least be able to shop with a degree of peace of mind. Even more frustrating than worrying about counterfeit products is you worrying about product availability and this is especially the case when you’re onboard a flight. To be fair, there’s only so much space for duty-free items on a cart. All too often, you’ve go into a store expecting to walk out all smiles with a brand-new purchase only to have the salesperson tell you they’re out of whatever it is you’re looking for. AirAsia Duty Free & Merchandise guarantees this will not be an issue. By making your purchase online in advance, you can rest assured you’ll have exactly what you paid for delivered to you onboard your flight. When it comes to online shopping, seasoned veterans will know that the first thing to do before hitting the “Buy” button is to do a quick check through the web for the best prices available. One of the big plus points with buying AirAsia Duty Free & Merchandise online is the ability for buyers to check and compare prices from the comfort of their homes before their flights. Just imagine you’d like a bottle of Estée Lauder’s latest fragrance–simply hit up OURSHOP.COM and you can immediately see how much you’ll save in comparison with regular store prices. When it comes to shopping at duty-free stores, the wide assortment of items being sold at duty-free prices can be tempting for most of us. This desire is very often offset by the obstacles and practical difficulties stated above. But hopefully with AirAsia Duty Free & Merchandise, going duty-free shopping might be a thing really looked forward to by travellers, both frequent and occasional. Moving into the year-end festive season, AirAsia is now holding the “Screenshot & Win” Facebook contest. Participants in the contest stand to win RM2,000 worth of Duty Free & Merchandise e-vouchers and AirAsia flight vouchers. 1. Go to OURSHOP.com and browse DFM products. To check out AirAsia Duty Free & Merchandise selection on OurShop.com, you can click here. Scare Actress Speaks Out Against Irresponsible Halloweeners: Shoved, Slapped, and Almost Lit On Fire.